Mahasti’s variation on pozole verde is a great excuse to visit some of Knoxville’s Mexican and Latin American markets for the tomatillos and poblano peppers called for in this recipe. Share your version with us on Instagram, Twitter and Facebook. Rinse chicken breast in cold, clean running water. Place chicken and bay leaves in large pot covered with 9 cups water. In a large pot, bring water to boil. Reduce heat to low and cook chicken for 25 minutes. Remove chicken from pot. Discard bay leaves. When chicken is cool enough to handle discard skin and shred chicken. Reduce heat to low. While chicken is cooking, rinse, de-stem, and de-seed poblano peppers, set aside. Rinse and de-husk tomatillos, set aside. Wash cilantro, leaving stems attached. Peel and cut onion into medium size pieces. Peel garlic. Pick ¼ cup of oregano leaves. Drain and rinse hominy. 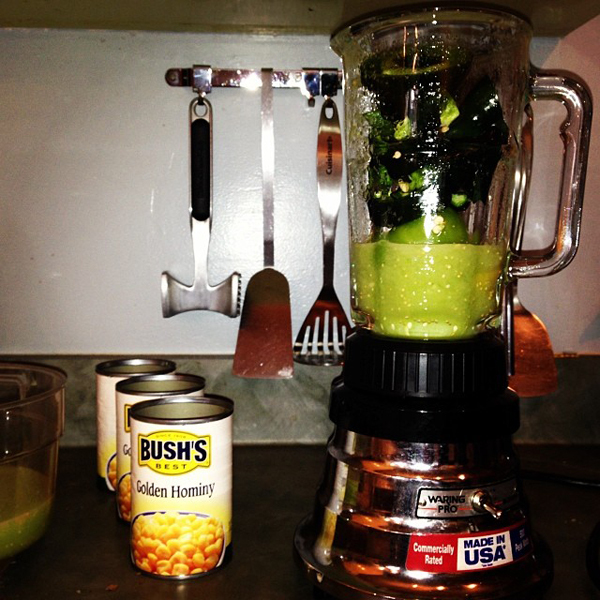 Place poblano peppers, and cilantro in the jar of your blender. Remove 1 cup of cooking liquid from the pot of chicken and add to the blender. Blend the peppers until smooth. Pour most of the blended pepper mixture into a large bowl, leaving about 1 cups worth behind in blender. Add tomatillos, onions, garlic and oregano to the blender and blend until smooth. Pour tomatillo mixture into poblano mixture. When Chicken has been removed from pot – add tomatillo-pepper mixture to pot. Add shredded chicken, hominy and salt. Increase heat to medium, stirring occasionally bring mixture to boil. Reduce heat to low and simmer soup for 15 – 20 minutes. Serve hot with Sides of shredded lettuce, sliced radishes, diced onion, cilantro leaves, jalapeno, sour cream and tortilla chips.